“I was at a race this past Saturday and was provided with a sample of Erich’s bread in our athlete bag. At Kasseler, we are passionate about good, all-natural breads. We feel they are an important part of happy, healthy living. Many of our customers are telling us “this is the bread our doctor is telling us we should be eating”. Whole grain rye breads are wholesome source of vital nutrients and fibre. Pumpernickel and Whole Rye breads have a low glycemic index. And Kasseler Rye breads actually taste good. Try them, you’ll like them! 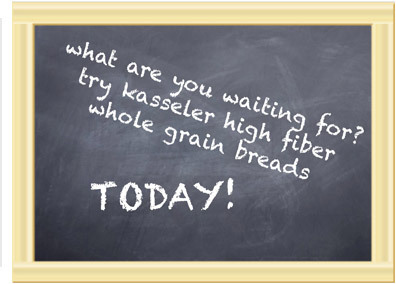 Kasseler whole grain breads – for breakfast, for lunch, for a light supper.